If you are in the market for a superyacht, I highly recommend purchasing and reading the Big Boat Bible, an onthology by Richard Friese at Yacht Shots Press. This book is on display at Blue Water Books in Fort Lauderdale and also available online through the Yacht Shots Press website. The bible presents articles from expert support providers to the superyacht industry including naval architects, yard managers, captains, maritime attorneys, and yacht brokers. 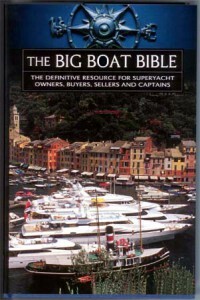 My favorite chapter so far is Ron Holland’s article on yacht design from the interior out. I also enjoy the wise quotes dispersed throughout the book like “Being rich is expensive.” The paperbook retails for $25 while the hardcover is $35.